The liberals are in outrage over Hindu celebration of Diwali. Since they could not find any other problem, they are outraging over some fumes caused by crackers during Diwali celebration. The irony gets lost over these arm-chair liberals who sit in AC during the whole summer, travel in airplanes and gas-guzzling SUVs, but leave no stone unturned to lecture the unwashed masses on protecting environment. Well, why should the unwashed masses celebrate anything and specially the Hindu heroes that the liberals hate so much? The data shows that pollution levels this Diwali were far more dangerous than last year. As per the SAFAR data, last year after Diwali, the PM 2.5 levels were 428µg/m³ which was nearly six times the safe limit. A newspaper which prides itself on reporting finance news does not even know the concept that air quality has too many factors and it is foolhardy to compare last year with this year’s level of pollution. A cloud cover can increase pollution much more than any Diwali. Or a small rain can reduce it to unimaginable levels. But why would they report anything else, when the agenda is to malign Diwali and somehow ban the festivity. The selective reporting of data to lecture pagans is something that libtards are best at. So, how did the actual pollution levels looked like this week? The above figures are taken from here, which tracks air quality in real time. So what does the above figures show? There is no significant difference post Diwali i.e. Monday 31st October 2016 and the days preceding Diwali. 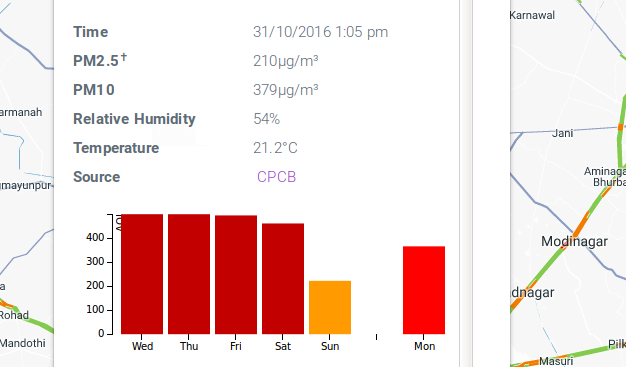 So pollution levels were in dangerous territory the whole week before Diwali. The overall AQI (Air Quality Index) hovered around 500 both before and after Diwali. So, why the outrage? It is obvious to anyone who understand even a little bit about air pollution that one day of Diwali will add hardly anything to the overall pollution levels in big cities, which get choked due to vehicular pollution as well as other factory emissions. The pollution goes down a wee bit over the weekends and Diwali might have kept it a little bit higher, but if you can live with high pollution on 365-52 days (year minus weekends), you can very well live with one more day of pollution on Diwali. The data punctures the narrative on high pollution levels due to Diwali. There is not much change in pollution due to Diwali even compared to previous week and the increase is definitely negligible in the overall pollution levels in a pollution sink-hole like Delhi. So, liberals can go and whine while we heathens will continue to celebrate our festivals with great pomp. The truth is these libtards just want Diwali gone so that they can digest Hindus into Abrahamic fold just like they got rid of Roman and other pagans before. Remove the festivity and kill the heathen religion.